Yorke Peninsula lies across the Gulf St Vincent from Adelaide and in a similar way to Italy is shaped much like a leg and foot, but much smaller at around 200 km in length. My prior post took a look at the setting sun at Moonta Bay which lies at the very top of the peninsula, at the ‘hip’ as it were. Travelling down the peninsula by road you eventually arrive right down the far ‘toe’ end. From Moonta Bay, it’s a 2½ hour drive, and 4 hours or so if travelling directly from Adelaide. Rugged Cape Spencer and West Cape define the toe and for this post I’m featuring sunsets again, this time at West Cape. 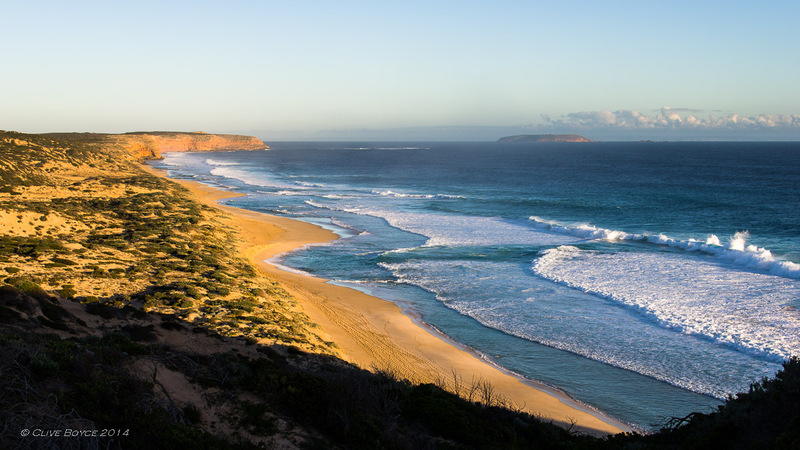 The two capes are within the Innes National Park and around 20 minutes drive from the last township on the peninsula, Marion Bay (which has previously featured on Photo Morsels in A wet and rainy day in Marion Bay). The images in this post were taken in July last year (2014) which is mid winter down here in Australia. Despite that, the weather while I was there was fine and mild. In sailing ship days, ships approaching from England and Europe would make landfall in the general vicinity of the capes and enter Investigator Strait in order to proceed to Adelaide. This would have been the first land those ships had seen since rounding the Cape of Good Hope at the base of Africa. Combine the navigational challenges associated with a journey of some 10,000 kilometers without any land observations, the presence of islands and reefs, strong tides and notoriously rough and windy weather on the wrong day, and the area soon became a shipwreck coast. To improve maritime safety, lighthouses were established as early as 1879. West Cape beach in the late afternoon, with shadow formed by the West Cape headland extending into the dunes. The patch of clear water perpendicular to the beach is a powerful rip carrying water deposited on the beach by the swell back into deeper water. Definitely not a swimming beach, and only experienced surfers look to surf here. This entry was posted in Australia, Places to Visit, Regional South Australia and tagged Innes National Park, Lighthouse, Photography, places to visit, Pondalowie Bay, Seascapes, South Australia, Sunset, West Cape, Yorke Peninsula on May 20, 2015 by aussiesouthlander.